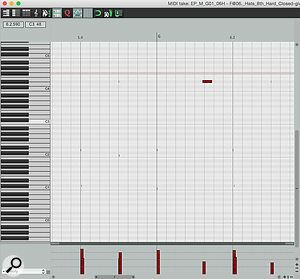 1: A MIDI drum loop copied from EZdrummer to a Reaper track and viewed in the default piano roll editor. It’s not the most informative of views! Having grown accustomed to using Cubase’s excellent MIDI Drum Editor through many years (decades, even!) of use, I found that I missed it when I started using Reaper. Actually, though, Reaper’s MIDI editor can be set up to work in a similar way, and while not everything can be replicated, it boasts some very useful features for composing and tweaking MIDI drum parts. Of course, most things aren’t set up by default in the way I like them, so in this month’s column I thought I’d take you through some customisations that I find make drum programming easier. 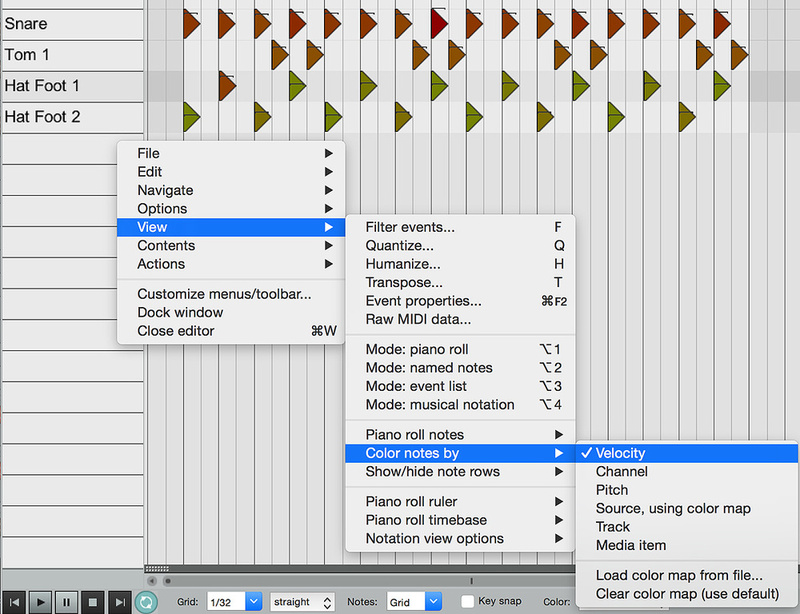 By default, if you click on a MIDI clip in the main project window, it will open in a fairly conventional-looking piano-roll editor — which should be familiar to anyone who’s used any DAW software before. But if you’re playing drums, a piano roll isn’t the best representation of what’s going on. For one thing, drums and percussion behave in a different way to most sounds. While there are exceptions, they’re largely ‘one-shot’ sounds, for which the note-off time is irrelevant; you might have two MIDI notes triggering a kick drum, one lasting a tiny fraction of a second, the other lasting three seconds — while the two look very different on a piano roll, they’ll both trigger exactly the same sound. And if you’re playing drums in via a MIDI pad or electronic drum kit, or if you’re planning on editing commercial MIDI drum loops, you’ll find that most notes will be so fleeting that they barely show up on the conventional note-as-rectangle view unless you zoom in to the nth degree. 2: It’s beginning to look a lot like Cubase...I was pleased to find that you can change things so that all notes for a given track are represented, as in Cubase, by a diamond: with the MIDI editor open, go to View / Piano roll notes / Diamonds (drum mode). The default shortcut for this view is Alt/Option+7, but there are also other views available. Actually, I find Reaper’s Triangles (drum mode) option better still, as the triangle shape gives a clearer indication of the note onset. You can customise what’s represented by the colour of the notes. For instance, the colour can be set to indicate the velocity of each note/hit, or the MIDI channel, which could be helpful if trying to separate drums from MIDI files that include more instruments (while there’s no guarantee that people will abide by it these days, the convention for MIDI is that channel 10 is reserved for drums). By the way, the MIDI Editor is docked by default but I prefer the editor to fill the screen — it just makes it so much easier to see what’s going on. To do that, either right-click over on the left of the window and select Undock, or click the dock/undock toggle switch (the green arrow pointing down at what looks like a tab) at the top. 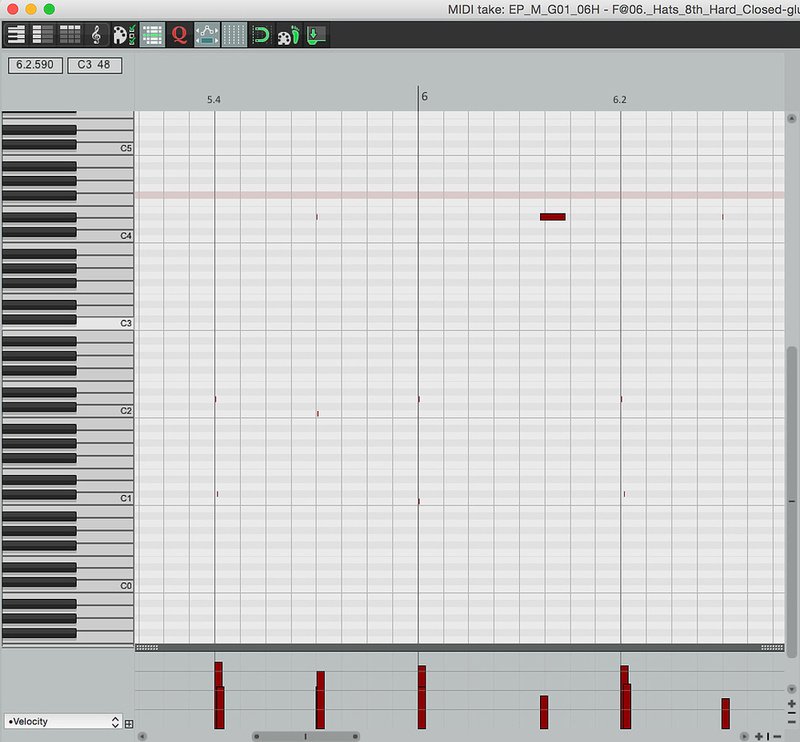 I hate having to remember which MIDI note is assigned to which drum, as this varies according to the instrument I’m using, so another useful feature is the ability to relabel the piano keys to reflect what drum each note triggers. To do this, double-right-click on the key, and a box and cursor will appear, allowing you to add text. So you can click on the key to audition the instrument, and then label the note according to what you hear. One limitation that’s worth mentioning is that your new note names are not used to name the tracks created when ‘exploding’ a drum part to put each kit piece’s MIDI part on a separate track. 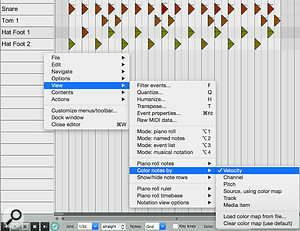 To do that, right-click the clip and select Item Processing / Explode MIDI item by note row (pitch). So, if you plan on doing that, which can make it easier to trigger different instruments, or to manipulate the MIDI data for individual kit pieces, don’t bother renaming the notes! 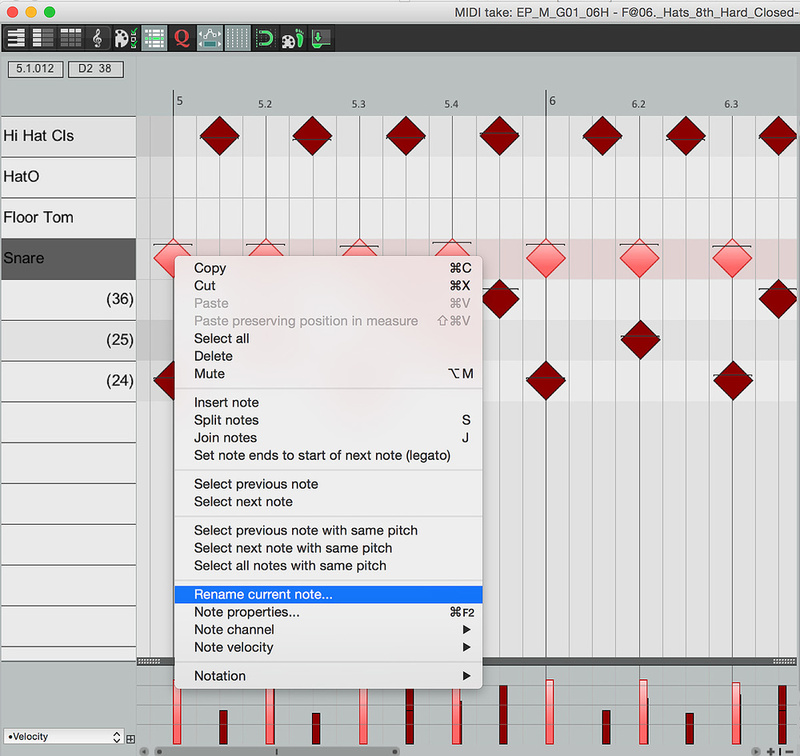 3: ...but Reaper offers many more options for customising the GUI of the MIDI editor, including representing notes as triangles, and the possibility of displaying the velocity next to each note.Another quirk is that the names can become obscured by other keys. For instance, when I first used the name ‘Hi-Hat Open’ on the white C4 note, the top half of ‘Hi-Hat’ was partially obscured by the black note immediately above. Partly that’s because the note name is displayed by default on all the C keys, to help you keep your bearings when scrolling, so there’s less space available, and partly it’s down to the height of the notes/rows in the editor — if you use the ± buttons in the bottom right of the MIDI editor to grow/shrink the height of the notes, the font resizes accordingly; with verticaly shorter rows, you’ll fit more of the note name horizontally on each key. The takeaway tip here is that it pays to keep your note names short — in this case the name ‘HatO’ worked just fine. Another feature I really enjoy in Cubase’s MIDI Drum Editor is the ability to drag the notes out of chromatic sequence, allowing you place any kit piece next to any other. This makes programming patterns containing only a few kit pieces (eg. kick, hat and snare) using only the mouse more efficient. While I haven’t found a way to replicate this entirely in Reaper, there are some options that take us very close. 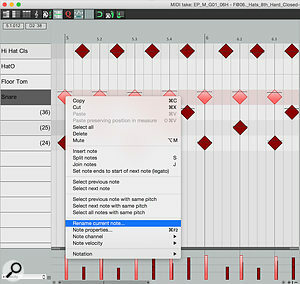 4: You can choose to colour notes/drum hits by pitch or velocity, which will be useful for different instruments — velocity is always going to be useful for drum programming!If you investigate the View / Show / Hide note rows menu, you’ll find three options: ‘Show all note rows’, ‘Hide unused note rows’ and ‘Hide unused and unnamed note rows’. The first two are self-explanatory: the first is the default, and the second hides all notes/rows for which there’s no MIDI data. The third is probably the one you want, though. This hides note rows if there’s no data, unless you’ve already given them a name in the way I’ve described above. So you could quite easily name an entire kit and hide all the superfluous MIDI notes. It’s slightly less sleek than in Cubase — there’s no facility to break the chromatic order of the note rows, and it’s a bit of a chore setting up all the kit piece names just to keep those rows available in case a change of mood dictates that you must add a cowbell or some such. So if you use a certain virtual drum instrument frequently (I’ll often sketch out acoustic drum parts using EZdrummer, for example), it makes sense to create this ‘map’ of names once, so that you can reuse it again and again. One thing I’ve not mentioned is that (by default, at least) these changes are only made to the MIDI editor for the track you’re working on. So it’s perfectly possible, for instance, to have this setup — with triangle-notes, named and hidden rows, and notes coloured by velocity — for your drum track, and a traditional piano-roll editor with rectangular notes for the song’s piano part (perhaps coloured by pitch and with velocity numbers by each note, helping you to spot at a glance the same notes in different chords as well as the velocity of different notes occurring at the same time). This begs the question of whether you can save your editor settings for use on another track or in another project, and of course the answer is that you can. Simply save the track you’ve been working on as a track template, and you can create new tracks with these settings, including the note names. At least, you can do that in theory. At the time of writing, I was using Reaper 5.70 on MacOS 10.10.5 and the storage/recall of this data seemed a tiny bit buggy — most times the note names were saved, but sometimes they weren’t. So after creating a template, create a new track from it, just to check things have saved as you’d planned. Also, for some reason I found that the tracks I created from a template defaulted to notes being coloured by pitch, even if I’d based the template on a track set to colour by velocity. Ah well, I suppose you can’t have it all; I’m sure these quirks will be ironed out eventually if someone with connections is reading this! In the meantime, I still find all these tweaks to the MIDI editor very worthwhile!